This week, the U.S. Supreme Court upheld a law passed by voters in Michigan that banned the consideration of race in public college admissions decisions. While eight states have passed laws restricting affirmative action since 1996, how has the racial makeup of college students and graduates changed? The biggest story is among Hispanics, who have made big gains in college enrollment, a measure that includes both two- and four-year schools. From 1996 to 2012, college enrollment among Hispanics ages 18 to 24 more than tripled (240% increase), outpacing increases among blacks (72%) and whites (12%). (The Census Bureau did not publish Asian college enrollment figures before 1999.) In fact, for the first time in 2012, Hispanics’college enrollment rate among 18- to 24 year-old high school graduates surpassed that of whites, by 49% to 47%. 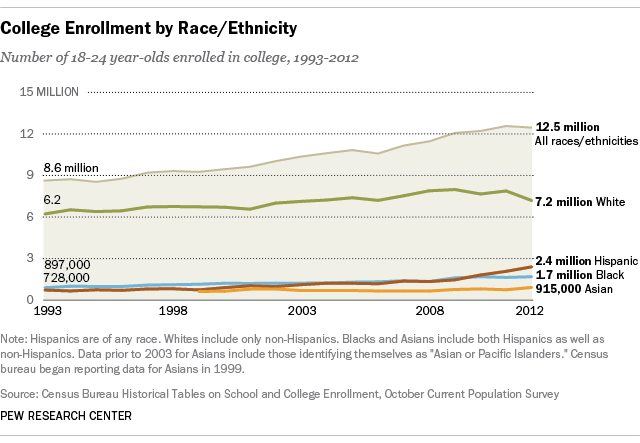 College enrollment grew among all race and ethnic groups during this 16-year period. Among Hispanics, college enrollment growth exceeded the growth in public high school graduates (141%) over roughly the same time period. The number of public high school graduates increased 63% among blacks and 8% among whites. In 2012, Hispanics made up about an equal proportion of all public high school graduates (18%) and all college students (ages 18 to 24) (19%). Whites, blacks and Asians also had about the same share of public high school graduates as college enrollees. But when looking at data of an older age group with bachelor’s degrees, a gap opens because a smaller share of Hispanics are completing a four-year degree. In 2012, Hispanics accounted for just 9% of young adults (ages 25 to 29) with bachelor’s degrees. This gap is driven, in part, by the fact that Hispanics are less likely than whites to enroll in a four-year college, attend a selective college and enroll full-time. While Hispanics are the most pronounced demographic story, the education data show different trends for other race and ethnic groups on college campuses. Like Hispanics, blacks are underrepresented among those with bachelor’s degrees. In 2012, blacks made up 14% of college-aged students (ages 18 to 24), yet just 9% of bachelor’s degrees earned by young adults. By contrast, whites and Asians are overrepresented among young bachelor’s degree holders. Whites make up a smaller proportion of students on campus today than they did 20 years ago, when three out of every four students on a college campus was white. In 2012, whites accounted for 58% of college-aged students, but 69% of young adults with bachelor’s degrees. Like whites, the data show that a high percentage of Asians complete four-year degrees. In 2012, Asians accounted for 7% of college-aged students but 11% of bachelor’s degrees earned. Americans by a two-to-one margin (63% to 30%) say affirmative action programs designed to increase the number of black and minority students on college campuses are a “good thing,” according to a new Pew Research poll. Blacks and Hispanics overwhelmingly support affirmative action and a majority of whites do, too. (Sample size for Asians is too small to be statistically significant.) Overall, support is nearly unchanged from 2003.